The U.S. 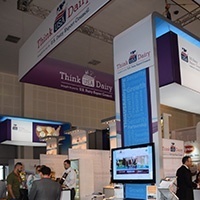 Dairy Pavilion within the Gulfood show in Dubai was the scene of bustling activity, as U.S. dairy suppliers connected with both new and existing customers throughout the Middle East and North Africa. The Gulfood Show, held February 8-12, 2015, is the premier food and hospitality show in the region, attracting buyers, end-users and chefs. Six USDEC member companies (Agropur, James Farrell and Co., Ronald A. Chisholm, Ltd., Saputo, Sartori and TC Jacoby and Co.) exhibited together with USDEC within the U.S. Dairy Pavilion, showcasing the vast portfolio of quality U.S. cheeses, whey ingredients, milk powders, butter and more. Several additional U.S. suppliers had their own booths or used the show as a platform for one-on-one customer meetings. In total, eighteen U.S. dairy companies participated in the Gulfood show, a reflection of the U.S. dairy industry's enthusiasm to expand and strengthen ties with customers throughout the Middle East and North Africa.